Durian Dynamite slot by Quickspin themed on that pungent fruit! Durian Dynamite slot by Quickspin may baffle you from the beginning and make you ask what a 'Durian' is - no, not a Duran Duran fan but a pungent-smelling fruit. Known as the Stinky Fruit in some countries is has a smell that has been labelled a mixture of garlic, turpentine and old socks and in some countries such as Singapore, eating it on public transport is outlawed! So it's a bizarre theme we have here with plain blue reels over a cartoon pipeline and funky music as we spin and the Durian unsurprisingly doesn't appear in other fruit games like the Fruit Warp, Fruit Shop or Fruit Case slots! So will the Durian prove to be dynamite for your bankroll or an absolute stinker? There are 20 fixed pay lines on Durian Dynamite slot with 5 reels of 3 rows ech and symbols including Wilds can appear stacked on all five reels. 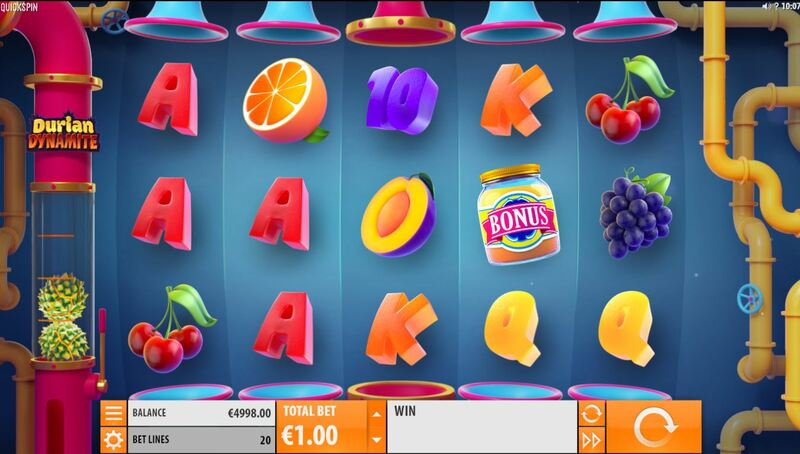 The pays for 5-of-a-kinds are 50x stake for the Wild, 25x Melon, Orange 20x, peach 12.5x, Grapes 10x and Cherries 7.5x with five card values paying either 5 or 3.75x for a full line. There are Jam Jar scatters on the centre 3 reels too, but what about the delicious Durian fruit? In the pipe on the left of the grid you'll see a transparent launcher with 2 durian fruit inside it. The 5 reels all have a blue drop pipe above them, but the centre one is active and coloured pink because it's a Dynmite Reel. If the Durian Fruit appears on reel 3 after a slowed-down spin, then the Durians in the pipe are launched onto the grid. If the first lands on the existing reel 3 Durian it will leave 1 regular Wild there and add 3 extra Wilds to the grid. When the second Durian is launched, it will add 2 extra Wilds if it lands on a Wild. You need the 3 bonus Jars on the centre reels. You are give 6 free games but will then be allowed to open at least 3 jars, and often randomly more Jars are offered. You will either get extra spins from them to a maximum of 36, an extra Durian in your launcher to the left up to a maximum of 4 or lastly an extra Dynamite Reel to a maximum of 3 reels. This means the Durian can appear on those too, not just the centre one. There are no retriggers or extra spins once the round starts, but a full screen of Wilds attained on any free spin would pay 1000x bet!